NEW YORK, New York, November 1, 2012 (ENS) – The death toll from superstorm Sandy continues to rise as search and rescue workers find more bodies of those who were swept away, drowned or died when trees crushed their homes or cars. 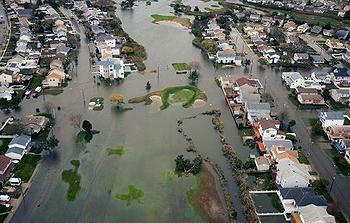 The storm made landfall Monday night near Atlantic City, New Jersey as a Category 1 hurricane. Sandy is known to have claimed the lives of 157 people, at least 88 of them in the United States, 38 of those in New York City. Two people died in Canada and 67 in Caribbean countries. The bodies of two toddlers were found Thursday in a wooded marsh on Staten Island, a borough of New York City. The boys and their mother had been trying to escape Staten Island Monday night when the storm surge flooded their SUV and then swept the boys from their mother’s arms as they tried to flee, officials said. The mayor warned that as the first responders continue their rescue and recovery work, the death toll will continue to rise. Mayor Bloomberg announced the distribution of thousands of bottles of water and thousands of pre-prepared meals at locations in hard-hit areas of the city this afternoon, and for several hours every day through Sunday. Some 400 members of the National Guard and 150 NYC Service volunteers and members of the Salvation Army are going door-to-door taking meals to homebound New York residents. Supplies were delivered by the Federal Emergency Management Agency in coordination with Governor Andrew Cuomo’s Office of Emergency Management. Many companies and individuals contributed to support this effort. 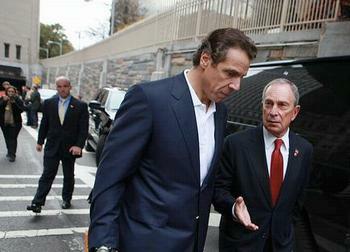 Bloomberg said cash donations to the Mayor’s Fund to Advance New York City are welcome, through 311 or nyc.gov. “You’ll be sure that 100 percent of your donations go directly to relief efforts and organizations,” he said. Getting New York City back on its feet means restoring mass transit service and restoring electrical power. The complete shutdown of mass transit Sunday night brought the city and Long Island to a standstill. Nearly two million homes and businesses lost power – about 900,000 in New York City and another million on Long Island. Hundreds of thousands of households and businesses lost power below 39th Street in Manhattan as Con Edison shut off the power and steam, used to heat high-rise buildings. 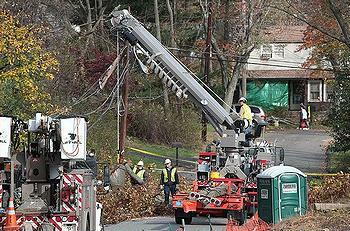 Con Edison said today that customers served by underground networks in that area will have service by this Saturday. Crews restoring underground service have pumped out massive amounts of water. They are now cleaning seawater from the equipment, which must be dried, repaired or replaced, and inspected before it can be safely put back into service. Con Ed calls the job the “largest customer restoration in its history.” Crews now have restored power to about 250,000 customers who were affected by the storm, while about 650,000 customers are still out of service. The utility said today that based on an assessment of “the unprecedented damage caused by Hurricane Sandy,” it expects to restore the vast majority of customers who lost power by the weekend of November 10 and 11. The remaining customer restorations could take an additional week or more. In areas served by overhead wires, Con Ed crews have had to repair more than 100,000 downed wires, blocked roads and flooding. Utilities and contractors from as far as California and Texas are on the scene, helping to restoring power to the New York and Long Island area and also across the storm-battered region. Sandy knocked out power to more than 8.2 million households and businesses in 17 states as far west as Michigan. About 4.6 million people are still without power, and there are fuel shortages across the storm-affected region. Thursday, the first of 17 U.S. Air Force cargo planes hauling 69 repair vehicles and gear from Southern California Edison to reconstruct the battered electrical grid in New Jersey and New York arrived at Stewart Air National Guard Base in Newburgh, New York. In New York, “bucket brigades” of National Guard members traipsed up 13 stories of hospital stairways to bring fuel 10 gallons at a time to rooftop generators at the city’s flagship public hospital, Bellevue. More than 700 patients were moved to other facilities Wednesday after fuel pumps flooded by the superstorm went out, putting Bellevue’s backup generators at risk. Other Guard members carried patients down those flights of stairs and out of the hospital to safety. Nearby, New York University’s Langone hospital, sent more than 200 patients to other facilities across the city in the midst of the storm. But the city is gradually recovering. Broadway theaters reopened Thursday, and the New York City Marathon will be run as scheduled on Sunday. The 2012 ING New York City Marathon offers a guaranteed prize purse of $853,000 the largest in event’s 42 year history and is welcomed as a much-needed economic boost for New York. Event organizer Mary Wittenberg said the race would not divert resources from the storm recovery. In New York City, bus service is up and running on many routes and MTA subway service was partially restored today after a day of frustrating gridlock on Wednesday. Officials said restoration of full service to the flood-damaged subways could take days, while Mayor Bloomberg today pleaded with New Yorkers not to drive in the city. With a limited number of gas stations open due to power loss, all the gas stations had lines stretching for blocks. Some fights broke out. All four major airports in the New York-New Jersey area were closed for two days, but JFK and Newark airports reopened on Wednesday at noon. Laguardia and Teterboro opened today and flight delays are less than 15 minutes at all four airports, according to the Federal Aviation Administration. U.S. Transportation Secretary Ray LaHood today announced he is making $12 million in quick release emergency relief funds immediately available to New Jersey and Connecticut to help begin repairing the damage caused by Hurricane Sandy, while assessments continue throughout the Northeast to determine the full extent of the damage. The funds – $10 million for New Jersey and $2 million for Connecticut – mark another installment of federal-aid highway funds going toward repairing damage from the superstorm. Earlier this week, DOT approved $17 million in quick release emergency relief funds – $10 million for New York; $3 million for Rhode Island; and $4 million for North Carolina. President Obama today made a campaign appearance in Las Vegas, Nevada, but he is still managing the federal government’s response to Sandy. 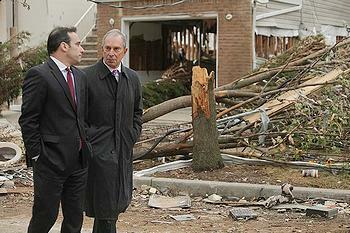 Total economic damage as a result of Sandy is estimated at up to $50 billion by the catastrophe risk consulting firm Equecat. “Large electric and utility losses will trigger significantly more insured losses (business interruption) than were expected from a more typical Category 1 storm,” Equecat said today.